You probably would never know it... but amongst the English and Scottish heritage in our family, my children have Italian blood in their veins. 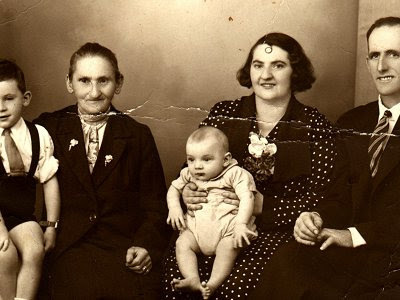 Their Great great Grandmother was an Italian lady (on the left in the picture), and that cute little baby in the middle is their Grandad (my husbands father). I wonder what delicious treats were cooked up in their household? My kids are very proud of their claim to Italian blood... mainly because of their obsession with Mario and Luigi (Nintendo icons). me too! Italian in the blood a couple of generations ago. My dad's grandfather was italian and came out to NZ to work as an expert gardener - his claim to "fame" being he planted all the olive trees on one tree hill for the Campbell's. A little secret... Hubby when at high school told a girlfriend that he was italian. Liddeleo. Haha It CRACKS me up.